Yes you read correctly. The worried looking bird-dog hybrid is alive, only now rendered at a noticeable higher resolution. Feather physics and great animation shone though, as the cell-shaded kid and his bird-dog friend picked their away across a crumbling bridge, using their individual abilities to help each other across. 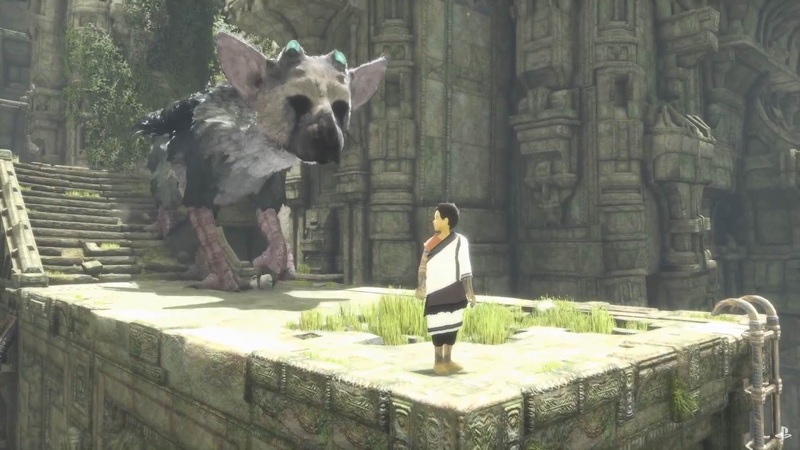 Despite having no investment in Fumito Ueda’s previous work, Kyle caught himself holding his breath involuntarily multiple times in the demonstration. It’s coming in 2016. Shuhei Yosida then entered the stage, clearly as overwhelmed by the announcement as the audience was, expressing his sincere happiness at finally being able to reintroduce the game. Next up, debuting at long last was Guerrilla game’s new franchise (they said franchise multiple times, so you know what they’re working on this generation…). The footage shown was captured directly from a PlayStation 4. Technologically advanced humans seemed to have ceased existing, though their cities remained, for a time at least, before new flora and fauna settled in to the land vacant. The trailer followed a woman hunting cyber-deer, for the canisters on their backs. Dispatching a prowling cyber-raptor along the way, before being ambushed by a gigantic cyber-tyrannosaurus Rex, that fired missiles out of its body. 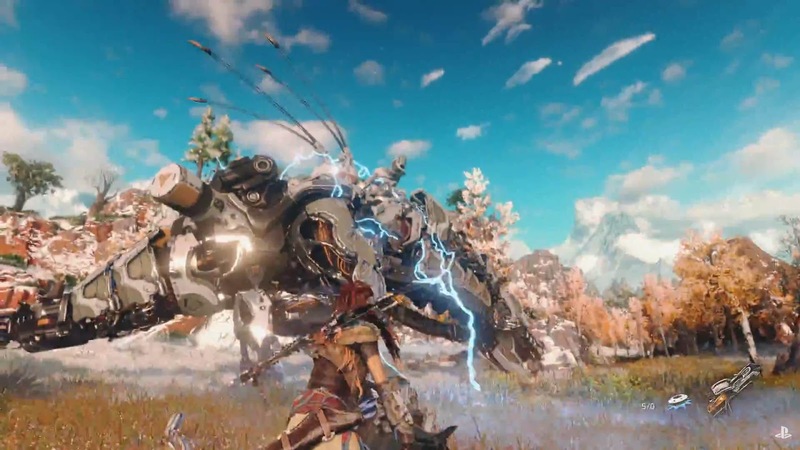 The hunter used a bow to blast away chunks of the mechanical monstrosity, picking up some kind of gun that fell from the creature. She eventually brought it down by tethering it to the ground, and striking at its glowing innards. It was played in third person and looked spectacular. Up next, with a rather glitzy cinematic trailer was Hitman. Four people, likely targets were shown going about their days; in an embassy under siege, at a fashion show, in a snowy forest, and at a pool resort. Agent 47 is back of course. The game will apparently feature a live, ever expanding world. PlayStation players are getting a console exclusive beta, and six unique contracts, post launch by the sound of it. Two new challengers appeared in the brief Street Fighter trailer; Birdie and Cammy. The game is coming to PS4 and PC, with an exclusive PlayStation 4 beta launching July 23rd. The majestic and shadowy No Man’s Sky was played on stage by Hello Games’ Sean Murray. He talked through some of the things players can do; starting with purchasing a ship, engaging a spot of dogfighting, before jumping to the impossibly large galaxy view and picking a planet at random. He emphasised that likely no one that been to the planet, he didn’t know where we was going, but he did modify the game to ensure a ‘beacon’ was nearby. 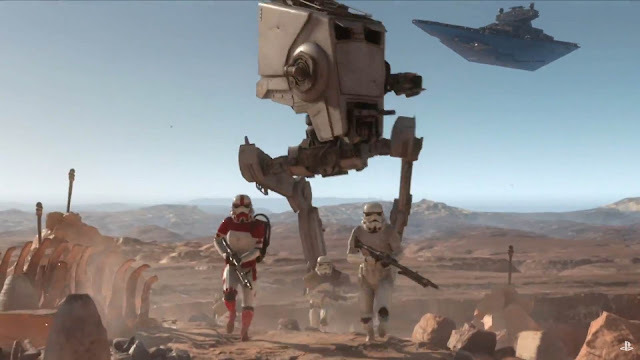 Scanning, destruction, and on-foot combat was all shown. Murray closed by promising it would be releasing soon. In typical Media Molecule fashion, their latest game is a weird one, driven by user creativity. People have dreams, and this game will allow you to create and share them. Objects can be painted into existence and manipulated, animated. Dreams, or just elements of them, can be combined into other dreams. Before closing the demonstration several very different dioramas were shown and then combined into one. A trailer of the mysterious adventure game Firewatch was shown, with a PS4 console debut. 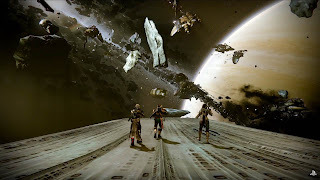 The expansion that has been leaking for weeks made its appearance, with a trailer flaunting some exotic new locations, the dark winged Oryx, and his dark army of Taken. Sadly, the Taken appear to be reskins of the existing races. More PlayStation exclusive content was announced, including a Crucible map and Strike. It will launch September 15th. At least parts of this Syndicate trailer were in-engine, though it was certainly not a gameplay demonstration. It focused around Evie Frye, the male protagonist’s twin sister. The PlayStation 4 release will come with some exclusive murder mystery missions. 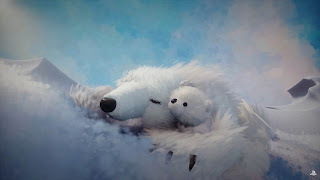 The world premiere of the next Final Fantasy game sported a chibi art style, introducing a resizing mechanic. Not much was revealed about the game, but it is coming first to PlayStation 4 and Vita, in 2016 (though Sony’s Adam Boyes stated it was exclusive). 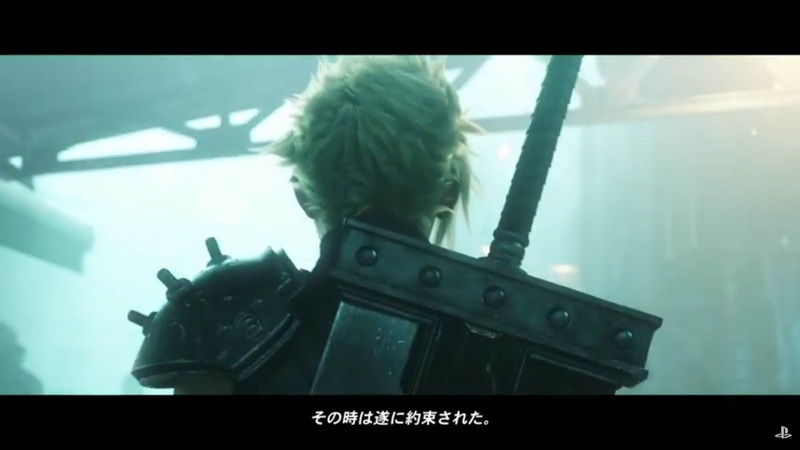 The classic Final Fantasy 7 is finally getting the true remake treatment that fans have clamoured for. A cinematic trailer showed glimpses of the renown Buster Sword, for classic Final Fantasy fans this could well be the biggest reveal of the show so far. It’s coming first to PlayStation 4. Four of Devolver’s games; Ronin, Eitr, Mother Russia Bleeds and Crossing Souls, are all making their console debut on PlayStation 4. Rounding out Sony’s trifecta of reanimated classics, Yu Suzuki was ushered on stage and the Kickstarter of Shenmue III was announced (it has already exceeded its $2000000 goal at the time of writing). Another trailer of the upcoming Batman Arkham Knight was shown, looking grimy and filled with savage nightmare-corpses. The Scarecrow Nightmare missions are coming exclusively to PlayStation 4. Several virtual reality Morpheus games were shown in quick succession; Eve Valkyrie, a football game, something involving plants, and The Deep (the shark game). The game Rigs was announced for the Morpheus, developed by Guerilla Cambridge, it’s a 3 versus 3 battle arena. Andrew House rattled through some statistics; Spotify was downloaded over 5 million times. Before announcing that, PlayStation Vue, their TV streaming service is launching that night in LA and San Francisco. It allows Vuers (like what we did there?) to subscribe to the individual channels they want. 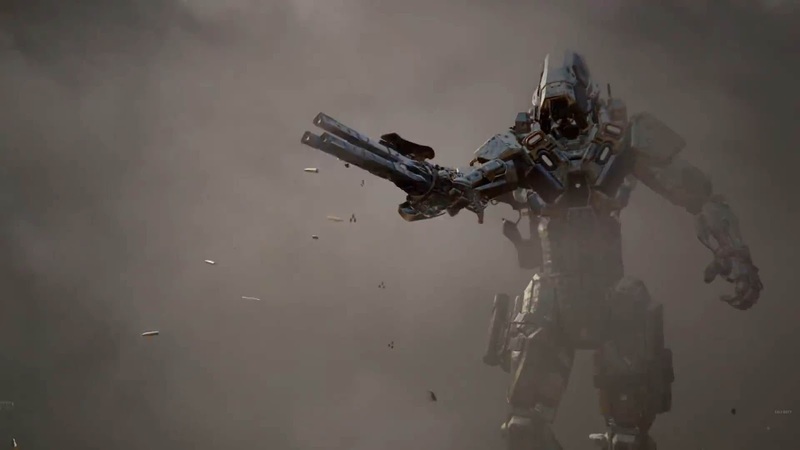 Mark Lamia introduced the Black Ops campaign; 4 players faced off against waves of robots, using force powers, bees, and vomiting. Players will select their loadouts before each mission. An AI-controlled soldier lead the way of course. 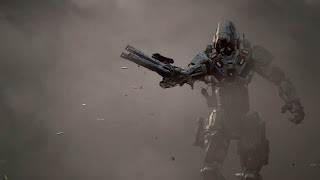 David Vonderhaar then introduced multiplayer, looking as fast-paced as a Call of Duty player might expect, only now with 100% more wall-running. Also robot gun arms. Map packs will appear first on PlayStation, in addition to a beta, Andrew House called PlayStation, ‘…the new home of Call of Duty.’. The game launches November 6th. Following a montage of upcoming games, Disney’s John Vignocchi appeared on stage, spiting hot game about Disney Infinity’s upcoming Star Wars additions. He revealed the Twilight of the Republic playset, set in the Clone Wars era. And releasing one month later, the Rise Against the Empire playset, set in the Galactic Civil War era. A limited edition starter pack exclusive to PlayStation contains the aforementioned playsets, with figures (including Boba Fett), the content will be available one month early on PlayStation. John Vignocchi’s enthusiasm was outdone only by Shuhei Yoshida’s earlier joy. Introduced by DICE’s Patrick Bach, a co-operative survival mission was shown. Deep in the ravines of and crevasses of a desert planet, two players completed objectives and blasted Stormtroopers, looking impressive once again. Sony closed the show with a demonstration of Uncharted 4. 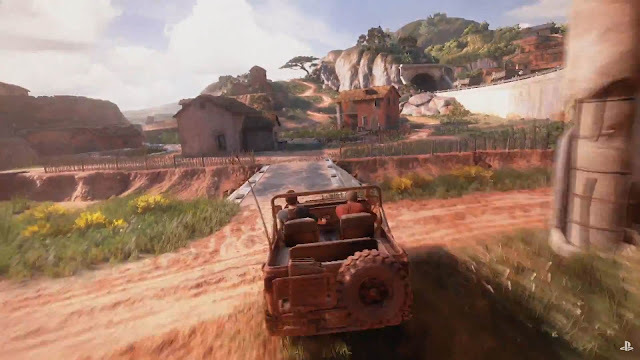 After a few technical hiccups, the live gameplay contained a shootout in a market place, followed by a vehicle chase through the countryside.